For more top stories from CedarNews, browse our other articles or download the complete newsletter from the menu. 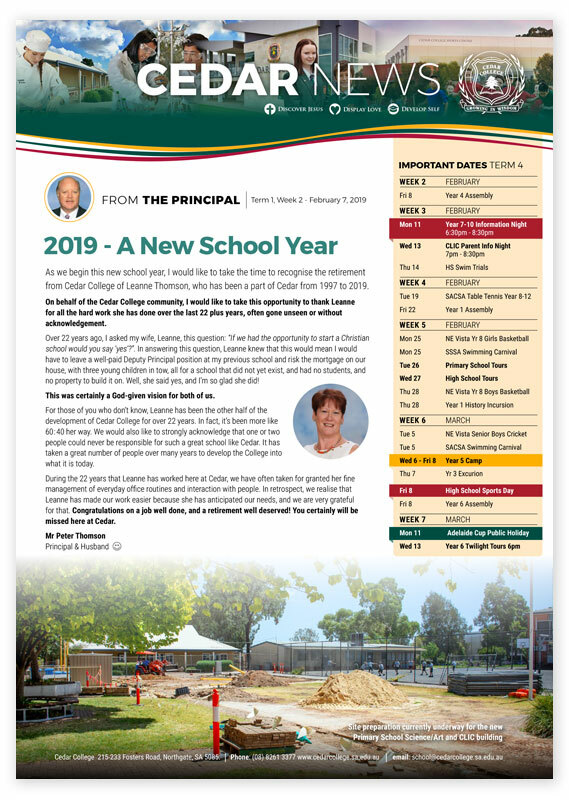 During the recent Year 6 Twilight Tours, key staff from the Middle School delighted in introducing the Year 6 students and their families from our current College community, to the life and facilities of the Middle School. There are many specialist classrooms and teachers to become familiar with. We work very hard in the Middle School to support students in connecting meaningfully with staff, form healthy and varied relationships with peers, and smooth out some of the extreme ups and downs of adolescence. The new Vertical Communities, that all High School students participate in each day, have already supported the Year 7s as they settle in and develop their new routines. Kate, in Year 9, shared the helpful insights and encouragement she has received from her Community Group. She related how important it has been for her to develop her organisational skills to meet the demands of Middle School, and the systems of revision and learning that help her manage her learning and schedule of tasks. 2015 graduate, and College Dux, Aly Montgomery (nee Early), shared about her relentless determination for academic and sporting excellence during her Middle School Years. Aly, who admitted that “anything less than an A+ felt like a fail”, talked about learning to rebalance her drive for achievement. Through a couple difficult years, it was the support of Aly’s parents, and the generous and flexible support of her teachers, that made the difference throughout her years at Cedar College. Parenting during the Middle Years can feel like a flash back to parenting your child as a toddler. In fact some of the biological changes and emotional vulnerabilities of puberty mirror those experienced during this earlier stage of life. This perspective can be helpful when your teenager literally “doesn’t know what they were thinking” or is overwhelmed by change or is completely exhausted. Don’t be surprised if your teen needs help to remember to eat appropriately or keep themselves organised one week, while the next week they have everything sorted and have unending advice about how you can sort your life out! Much like the preschool years, your teenager will probably continue to need your boundaries to get the sleep and rest they need. Adolescents experience considerable internal and external changes during Middle School. Some are eagerly anticipated, like becoming taller and stronger, while others seem to sneak up on us all and get in the way! Through all the planned and unexpected twists and turns of adolescence, we look forward to walking alongside our Middle School students and working with their parents each step of the journey.